Please find here a sample translation of the second chapter. French (for Europe), Italian and World English rights. Do you sometimes catch yourself snacking without even feeling hungry? Do you crave some foods more when you're under stress, worried or unhappy? Do you feel you've lost control when you give in to a craving? This book is for you! The authors suggest you make peace with your body and transform your relationship with food to rediscover the pleasure of eating, without guilt or anxiety. Equipped with vast experience in supporting people who binge eat or experience episodes of compulsive eating, they have developed exercises, tips and tools that have been proven to work. By rethinking your relationship to food, by reconnecting with your body's natural signals and modifying the thoughts that cause anxiety, you will break the compulsive eating cycle and make room for the feeling of equilibrium and pride that you so deserve! 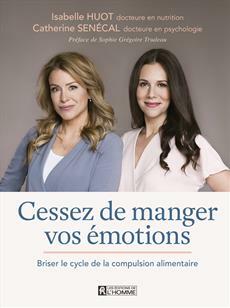 - The authors speak both to people who have occasional compulsive eating episodes and to those with diagnosed hyperphagic bulimia. - This book contains many tips and exercises – related to nutrition and psychology –, making it a truly practical tool. - The authors suggest three kinds of food diaries: one to understand our relationship to food and the contexts in which we lose control, a second for learning to recognize our feeling of fullness, and a third for identifying our mistaken beliefs and replacing them with realistic thoughts that promote our well-being.